Kotobuki is a ramen shop in Tokyo's Ikebukuro area, famous for its tasty Lemon Chicken Ramen. They offer a vast variety of excellent chicken ramen dishes that can satisfy the tastes of even the most health-conscious customer. Kotobuki is a cozy chicken ramen shop located close to Ikebukuro Station's west exit which you might just walk by if you did't know about it. Let us tell you why it is worth taking a closer look. Kotobuki is a fairly new ramen shop. It opened its doors on July 2nd, 2014, and has quickly become a secret tip among ramen lovers, as well as people who would usually not visit a ramen shop on a regular basis. The cozy interior of Kotobuki has a warm, slightly playful feel to it. The walls are decorated with grey koi carps swimming towards heaven, an auspicious symbol in Japanese culture. "Kotobuki" means long life, luck and happiness and koi carps stand for these things as well. An old story says that if a koi carp can reach heaven, it will turn into a dragon. There are dragons at Kotobuki as well but you will have to go by yourself to find out where they hide. Even a couple of celebrities really love Kotobuki. The sign on the top left is the one of the famous TV personality Shokotan. She is best known as the presenter of Pokémon Sunday on Japanese television. One of the reasons why ramen restaurant is such an insider's tip is their Lemon Chicken Ramen. This dish has the perfect creamy chicken soup base topped with juicy chicken and thick fresh lemon slices. This ramen dish can be enjoyed in various ways. You can either make a mess like me and squeeze the lemon juice into the ramen bit by bit while eating it or you can mix them into the ramen. 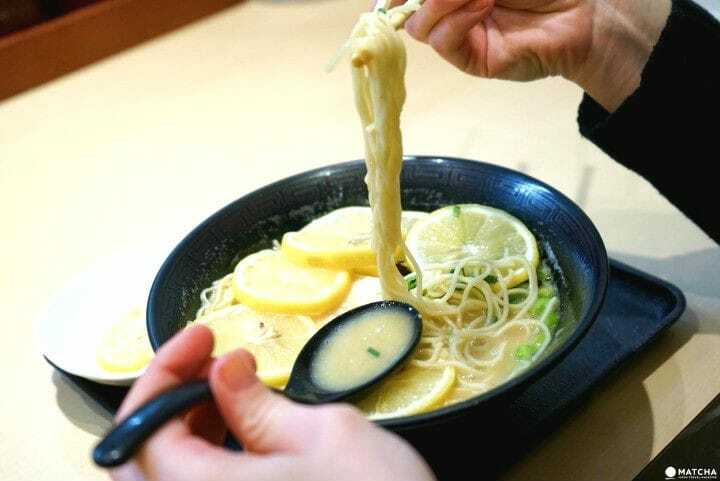 If you mix the lemon slices into the ramen, you can eat them together with the noodles and soup or just enjoy the lemon flavor dissolved in the soup. Either way, the lemon slices will give the creamy ramen a fresh and slightly sour edge. This ramen is perfect for summer or if you caught a cold, or if you are seeking a lighter dish that is kind to your stomach. Chicken soup is known for being a cold remedy anyways but this one is a creamy comfort food full of protein and vitamin C. It will get you feeling better, refreshed and full of energy in no time. You don't like lemons or you want something with a richer flavor? Kotobuki has a vast selection of various chicken based ramen. Another dish we really recommend is the Sesame Ramen (Tantan Ramen). The sesame gives this ramen a thick, creamy base. Topped with tasty harshed meat, baby corn and a healthy helping of spinach, this dish is rich and creamy, providing you with a unique ramen experience. If you have a Facebook account, make use of their special offer to get a free egg as a topping for your ramen. Simply like Kotobuki on Facebook and show them the Facebook page on your phone. If you want to try it in Japanese you can say: "Facebook ni iine shimashita!". This means "I liked you on Facebook". Their egg topping costs 100 yen, so this is quite a good deal. Like many ramen shops, Kotobuki provides you with free toppings and spices. I especially recommend the free sesame topping because it goes great with all of their ramen. Kotobuki has a ticket vending machine. To order, you first buy a ticket with your desired dish and hand it to the staff. Because the menu is in Japanese, let's go through the available dishes one by one. First row: Chicken Ramen, Chicken Ramen with Egg, Chicken Lemon Ramen. Second row: Jelly Ear Mushroom Chicken Ramen, Maitake Mushroom Chicken Ramen, Chicken Ramen with Extra Chicken. Third row: Chicken Ramen with Bean Sprouts, Sesame Chicken Ramen, Chicken and Fish Ramen. If you're not sure what to order, the staff will be more than happy to help you out. Just point at the ramen dish you would like to have and they will help you to order it on the machine. Creamy but Healthy Ramen with a Twist! Even if you usually don't care much for ramen but appreciate a good chicken soup, you should give Kotobuki a try. They offer a vast variety of creamy chicken ramen with flavors ranging from plain or refreshing lemon all the way to rich nutty sesame. Kotobuki's ramen is the perfect traditional chicken ramen with a twist. Don't walk past by it when you're in Ikebukuro!